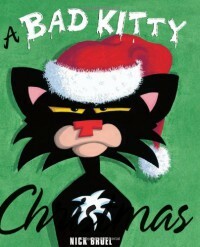 Bad Kitty Christmas is a play on 'The Night Before Christmas' but for cat lovers. Telling the tale of Bad Kitty and the mischief she gets up to on Christmas Eve, this story will have cat lovers nodding sagely as they encounter familiar antics. It's doubtless a great pick for children but as I don't have any, I read it for myself and really enjoyed it (well, actually I listened to the audio version but more on that later). The kitty is naughty but lovable and the message behind the story is very touching: accept your kitty's naughtiness - it's part of owning cats and you'd miss them terribly if they were gone. I got the audiobook version from Audible and I must admit if I were rating this on that alone, I probably wouldn't be able to give it more than 3 stars. I just don't think the reading does it justice. However, having looked at the book illustrations and based this review on the merit of the poem itself and the illustrations within the book, I feel fully justified in giving it four stars. A lovely fun poem for Christmas for pet and cat lovers!